A Wheelbarrow Full of Style: Picks from across the pond! Picks from across the pond! Even though it's great that we now have a few more online stores opening up for plus sizes I feel like it has taken a long time to get here. I remember going on holiday to Boston 10 years ago and coming back with a suitcase full of clothes because there was nothing to wear over here. Most weekends when I went shopping I would end up coming back with a ton of accessories and no clothes. Hmm, maybe that's where my love of handbags started! The first store that I went into was Macy's and I was surprised to see a Ralph Lauren plus range, cue multiple shopping bags in my hands! One store that I became particularly fond of whilst shopping in the US was Lane Bryant. I remember buying a pair of trousers that lasted me a good few years before I had to throw them away, the quality was excellent and the fit was good as well. The same can be said for all the tops and jeans that I bought as well. I recently had a look on their website and noticed that they ship to the UK. Yes they are expensive but I feel that if I purchase something it would last me a long time again. Here are a few other items I have my eye on. Will I be buying a lottery ticket tonight, oh yes! 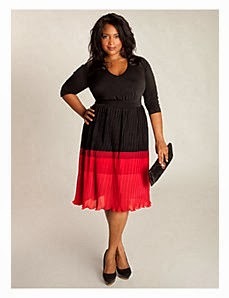 You can find all these items here on the Lane Bryant website. Do you think the Plus Size range in the UK is better than it used to be or could it still improve? It's amazing that there are more choices today for plus size women then there were 10 years ago. It's taken a bit of time for the industry to recognize fashion for larger women. I tend to find Lane Bryant a great choice for basic clothing. They are truly affordable. Especially when they have their sales. So, I have to agree with you. For those that purchase internationally its worth the extra buck!